This is a wonderfully crafted solid copper therapy magnetic bracelet. It is made with only solid metals made from pure copper and no color plating. 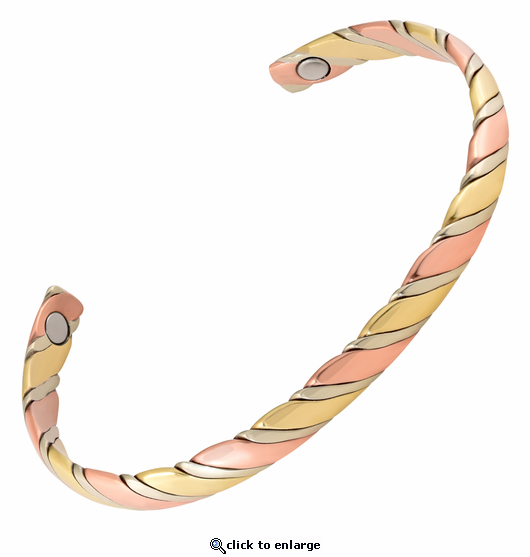 Styled in pure copper with brass(about 85% copper) & silver(about 60% copper), this magnetic bracelet has 2 powerful 3000 gauss neodymium rare earth bio north facing magnets and stainless steel magnet caps for added durability. This special design is suitable for any occasion or everyday wear. I love this bracelet.....beautiful quality and a perfect fit. I so appreciate your considerate service and quick shipping. The product is very good, I like it. The service was good, no complain. not the quality I expected. Reply by MJS. We are so sorry to hear this. This bracelet is really top quality and made of only solid metals and pure copper.It really is a finely made bracelet. It also has very strong magnets. Please let us know why you think so and if we can do something to help. We are glad to help. We are also glad to exchange sizes or styles if you wish.